the most complicated season because not everything can be comfortable to dress up to handle the high temperatures. 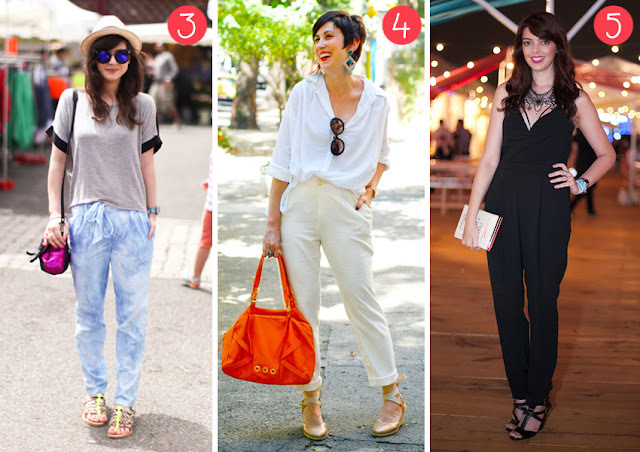 for this reason I chose 10 beautiful comfortable look to use on the summer. 1- This is a what we can call minimalist and simple look: this is a long white shirt, flat sandal and sunglasses, it’s similar to the European style, simple, light and beautiful. 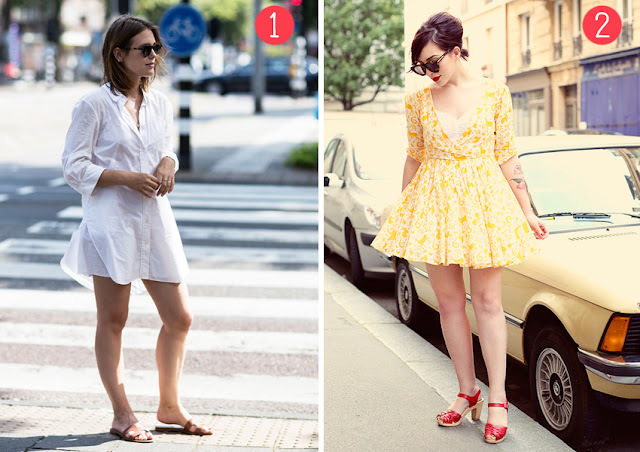 2- Retro inspiration on sandals, sun glasses, dresses and hair style. The delicate combination of the yellow and red on the details of the sandals and the lipstick , specially because these colors can be complicated when comes the time to match them. 3- If you prefer to use pants on summer, choose the light and soft ones, if prefer use with an mirrored sunglasses to be more stylish. 4- When time comes to match different colors choose the light ones which gives you a felling of freshness. 5- As option to go out at night add the tendency of the overalls with the strappy bra. 6- I love this look because it’s a lot comfortable, light regatta jeans with shorts and flat sandals. Jeans shirt suits well everything you can imagine. You can use it with any kind of shorts. 7- Looks beautiful with Kimono, see that the model uses only with jeans short and a basic white blouse. The Kimono makes the look more fashionable. The combination with stripes sandals make the look more feminine. 8- A basic way to use flat sandals, skirts and t-shirt. I chose this look because of the gray color of the t-shirt, it’s neutrum like the black color, but it also can be a bit lighter, it’s more comfortable to use in the warmer days. See how beautiful is the combination of pink with gray, isn’t it? 9- Super destroyed Jeans and colorful, very appropriated for the summer, the purse with lines of fringes makes the look very casual. This is a great way to dress up for a get way on vacation days. 10- The Midi Skirt is another great option for the warmest days and it’s length makes it perfect for the daily use You can use it on the bus uncross the legs without to worry and nobody will step on it’s ham . which happens with the long skirts. Any look that you identify yourself and like more?